Several months ago we received an email from The Kuwait Society for the Protection of Animals and their Habitat (K’S PATH). They had found a young, male meerkat wandering the streets of Kuwait City. The meerkat was terrified and starving. 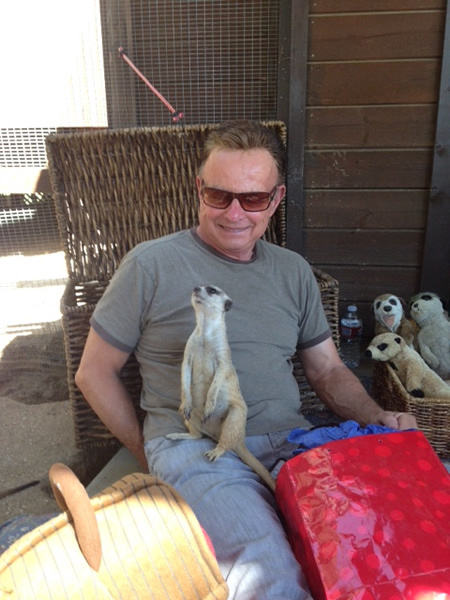 K’S Path, very kindly, took the meerkat to their sanctuary for protection. 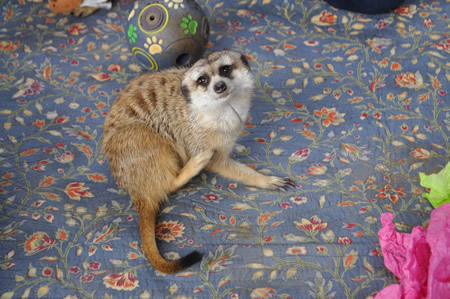 It is speculated that the meerkat was the victim of “black market” trading in exotic animals. 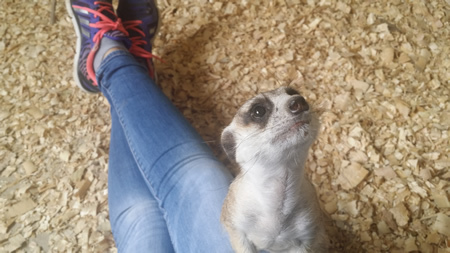 Although K’S Path is experienced in caring for a number of animal species, they were not practiced in caring for a meerkat, so they sought our advice about diet, housing, and enrichment. We, of course, were delighted to help and dozens of emails flew back and forth from Kuwait to California. 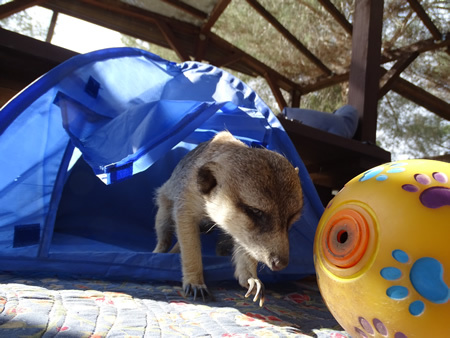 K’S Path named the meerkat “HAKUNA” after the famous song, Hakuna Matata, from Disney’s THE LION KING. 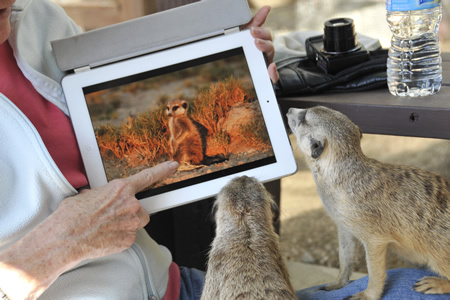 Coincidentally, our director, Pam Bennett-Wallberg, was the consultant for the meerkat character of Timon in The Lion King and worked with 100 enormously talented Disney animators on the movie. 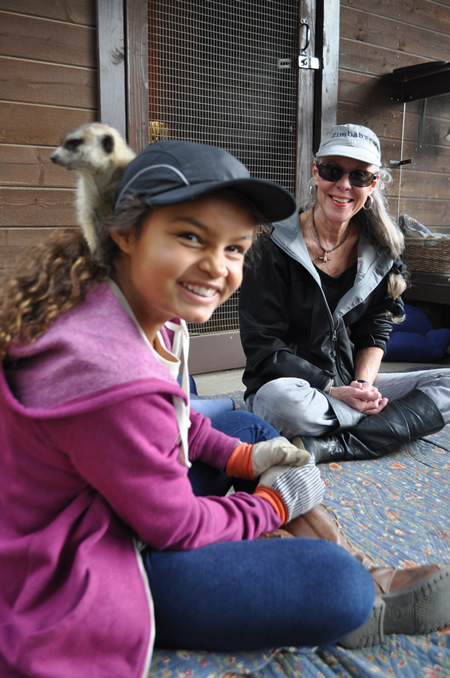 K’S Path asked if we were willing to give “Hakuna” a life-long home at Fellow Earthlings’ Wildlife Center so he could enjoy the companionship of other meerkats. We immediately said yes. Although, for 26 years, we have held licenses from California Fish and Game, U.S.D.A, the U.S. Fish and Wildlife Service, and a permit for Injurious Wildlife, we did not have an IMPORT LICENSE which was necessary to transfer the meerkat from Kuwait to California. However we, at Fellow Earthlings’, decided to pursue our “quixotic” endeavor. We made dozens of phone calls and sent out even more emails to various people whom we thought might be able to help or, at least, point us in the right direction. All the phone calls and emails led to countless “dead ends” with the exception of one email that we sent to a senior staff member of the U.S.D.A. This staff member, very kindly, called a senior Director of the U.S. Fish and Wildlife Service (USFWS) about the meerkat from Kuwait and our need to obtain an Import License. We were given a private telephone number for the USFWS Director which made us feel a bit like C.I.A. operatives. Pam, with a shaky voice, told the Director that we were, indeed, prepared for the challenge. Then, the Director referred Pam to the application form that we would need to fill out. The paperwork was tedious, frustrating, and seemingly ENDLESS. When we finally compiled the requested paperwork, forms, photographs, blueprints, resumes, copies of our licenses, veterinary records, emergency evacuation plans, etc., we looked at the “piles” of paperwork for several days to be sure we had not made any errors. We were told that just one small error would scuttle the whole application. We “dodged” a bullet when we finally noticed that we had to sign and date the application in BLUE INK. We, originally, had used BLACK INK. When we mailed the paperwork, we were all as nervous as long-tailed cats in a room full of rocking chairs. After many, many long, nerve-wracking weeks of waiting, we have finally been told by the USFWS Director that we qualified for the Import License. And, as you might expect, we’re happier than a dog wagging two tails. We are now waiting for the Export Permit and the Veterinary Certificate from Kuwait. Then, we will be free to coordinate transportation to fly “Hakuna” from Kuwait to California. 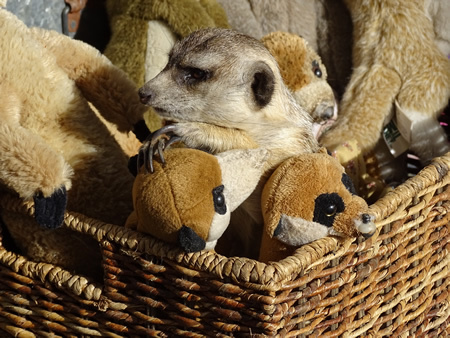 In our 26 year history of caring for meerkats we have only once asked our donors to help fund a project that benefited the meerkats. 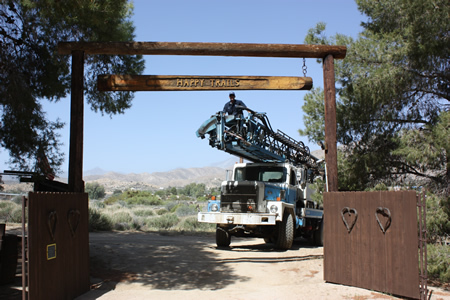 That first request occurred 10 years ago when the massive 2005 Morongo Valley wildfire burned our fences. 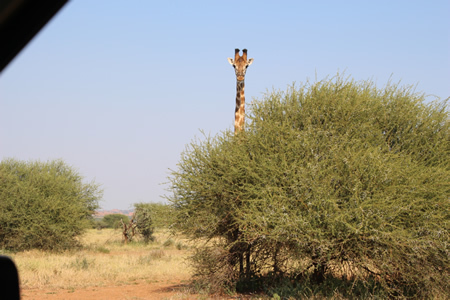 For the security of the meerkats, we needed to rebuild the fences and you, our angelic donors, responded generously to our request and we were able to erect new fences immediately. Our well was installed many years before we purchased the acreage for the meerkats. Unfortunately, we were not informed that the well was improperly installed until after we bought the property in 1999. 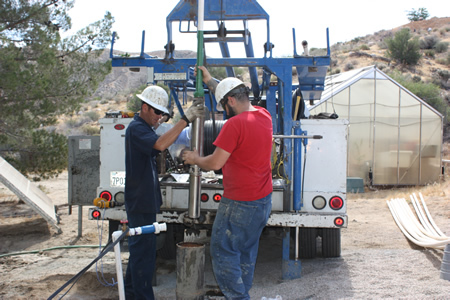 For 16 years we have tried many expensive “stop-gap” methods to make the well water safe to drink and useable. Sadly, those methods completely failed after 16 years and the well water was no longer safe to drink nor did the well produce enough water for our needs: To provide safe water for the meerkats, to irrigate the trees which give the meerkats shade during the hot seasons, and to have enough water to “wet down” the dirt in the enclosures which prevents cave-ins that are potentially life-threatening for the meerkats. We received professional advice from three water experts and their opinions concurred. We had to drill another well. 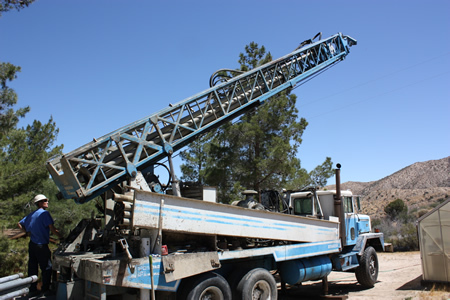 Subsequently, we contacted several well drilling companies and they all gave us similar bids of between $19,000 - $20,000. That sum was, of course, shocking to our 501(C)3 non-profit sanctuary. 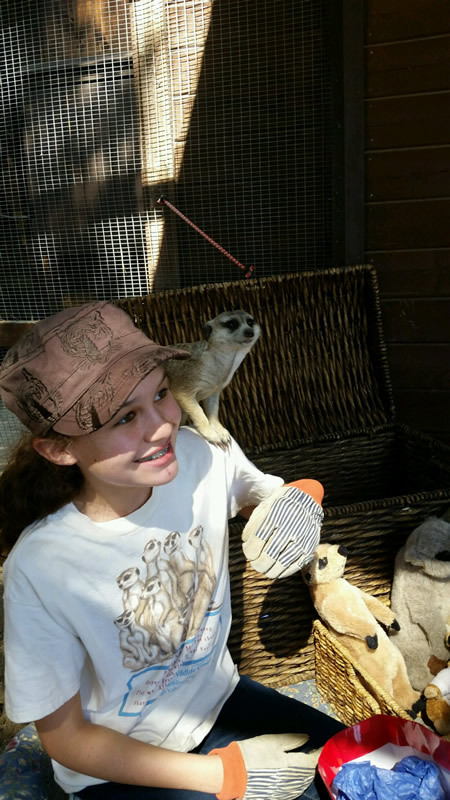 So, for only the second time in our history, we contacted some of our most treasured “Mob Members” with a request for a tax deductible donation to help us fund the meerkat’s new well. Your angelic donations began arriving just days after we mailed out the letters asking for help. Each and every one of you holds a special place in our hearts. We will never forget your generosity and kindness. We send you heart-felt gratitude! 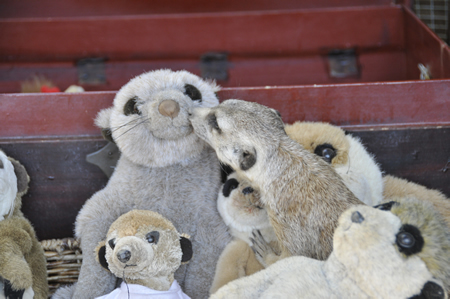 Now, take a peek at what you, our very special donors, have given to the meerkats. Photo credit: G. Stoneman M.D. 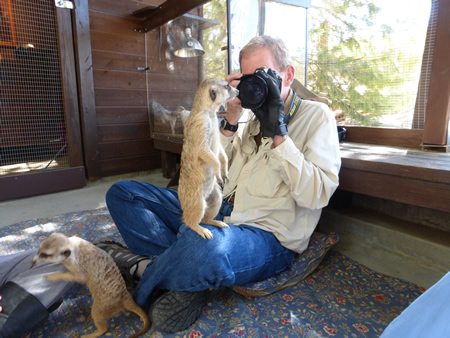 Dr. George Stoneman and the meerkats. 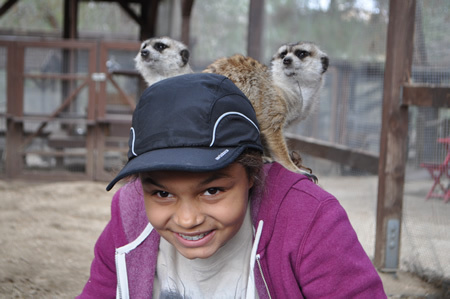 Pam Bennett-Wallberg smiles as Kulu enjoys a “perch point” on Amaralyn’s head. 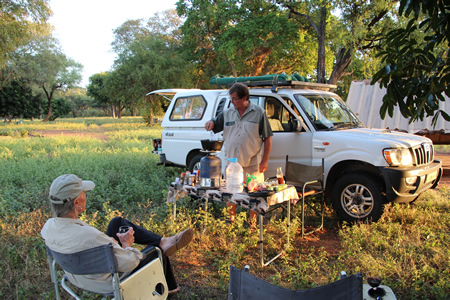 Dr. Goldstein consulting with Kavango. 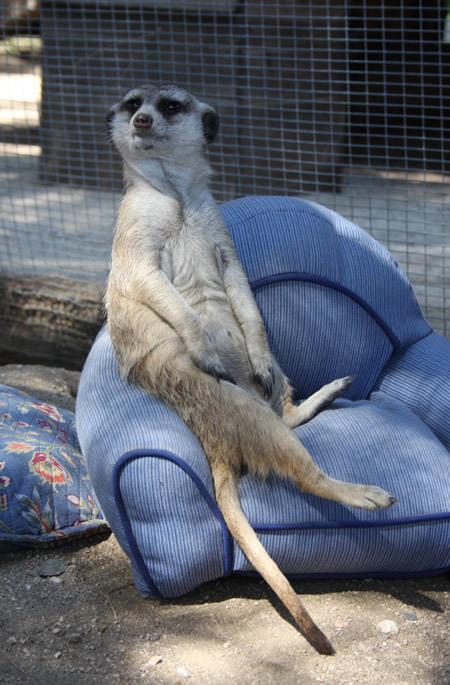 A meerkat from Fellow Earthlings’ Wildlife Center that is trying to stay awake after entertaining guests. 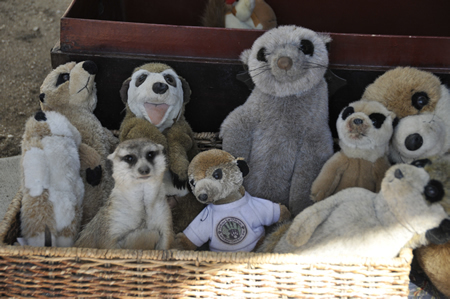 The meerkats send you their heart-felt thanks for adopting and re-adopting, making donations, and buying our merchandise. As we say in Afrikaans, Baie dankie! Many thanks! 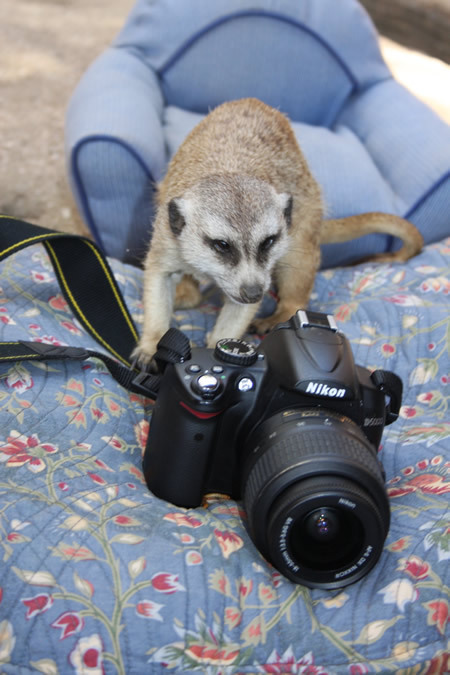 The African tours that Dantes Liebenberg and I do together for clients each year benefit the meerkats at Fellow Earthlings’ Wildlife Center enormously because a small percentage of each client’s tour fee is donated to the meerkats. 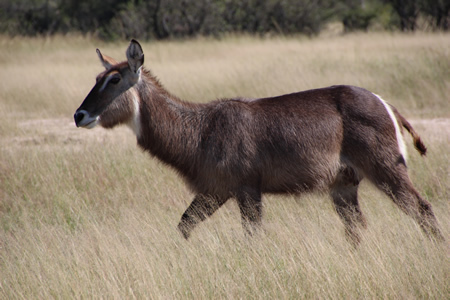 Elisabeth Spiro has done three tours of Africa with Dantes Liebenberg and me. She is NOT a tourist; she’s a traveler in Africa. She’s calm, intrepid, resilient, appreciative, and adventurous. 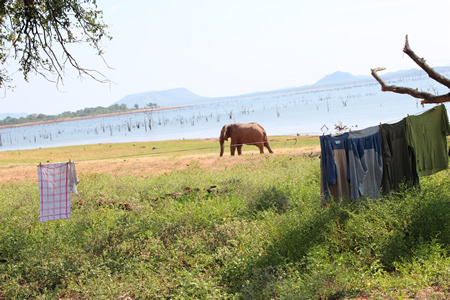 The accommodations that we provided for her first two tours in Africa were posh chalets with all the amenities: Electricity, private bathrooms, and hot water. 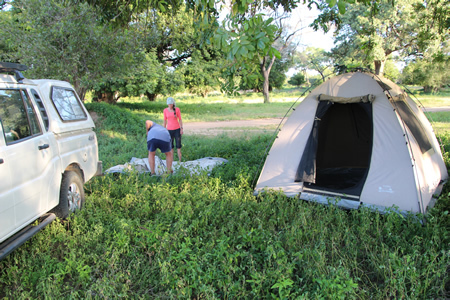 For her third tour of Africa, Elisabeth wanted to experience something a bit different ~ a month-long camping tour throughout all of Zimbabwe. Dantes put together a brilliant itinerary for her and we selected May 2015 for the trip. 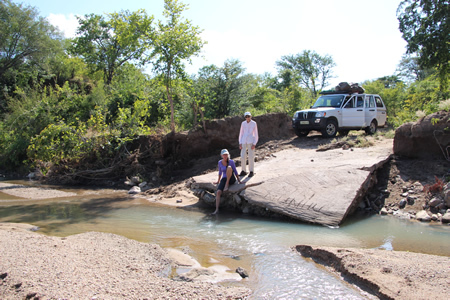 It was just the three of us: Dantes, Elisabeth, and me traveling through some of the most remote, pristine areas of Zimbabwe. Although Elisabeth was looking forward to the tour, initially she was a little nervous because she had never camped before. 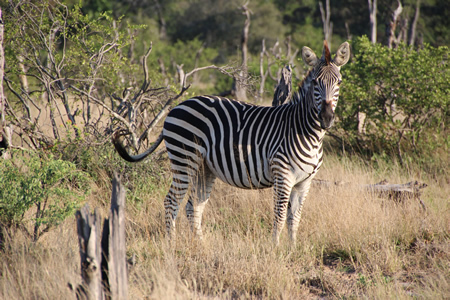 So, on several occasions, she visited me at Fellow Earthling’s Wildlife Center and I shared my “Camping in Africa” tip list with her. There is so much to write about THE GOOD of the tour. It would take three newsletters to cover just the highlights. But, for clarity and brevity, I will write just a bit about this stunning and vastly memorable trip. We had astonishing, jaw-dropping experiences, adventures, and sightings: Beasts of every strength and stripe, sunlight decanted lavishly upon the land, avalanches of hoof beats, secret places of silence and beauty, patent leather noses, a thousand wings grabbing for the sky, and pristine sanctuaries which feed the soul and dazzle the eye. 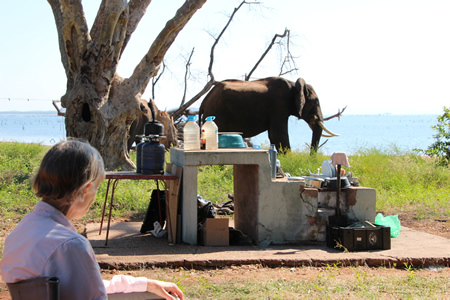 Vincent, our ebullient camp host at Hwange, has lived in a hut for 13 years without electricity. Dantes gave Vincent two solar lights and wired them to his hut via a small solar panel. Vincent was delighted that he finally had power to illuminate his small abode and he danced in the khaki-colored dust for a full minute before he rushed over to shake Dantes’ hand and hug me. Then, he resumed his “dance of joy” which produced clouds of dust that enveloped his small body. 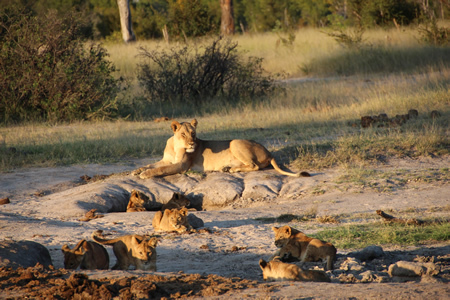 There are active lion prides and other notable predators in Hwange, Zimbabwe so we worried when we saw Vincent roaming through the dense brush (unarmed) with a wheel barrow to collect firewood. 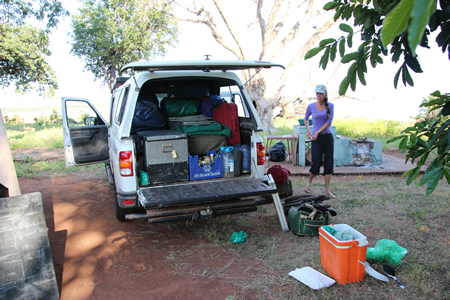 Dantes, Elisabeth, and I returned to camp and unloaded the gear from our truck so we could use the vehicle to help Vincent gather as much firewood as quickly and safely as possible. We were rewarded by another happy dance from Vincent. Elisabeth has already booked her fourth tour in Africa with us for May 2017. 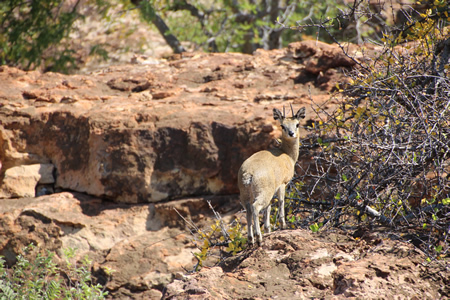 Another couple, who has done two previous tours with us, will round out the number of clients to just 3. Additionally, Elisabeth will do another camping tour with us after her 2017 tour. We are thrilled. 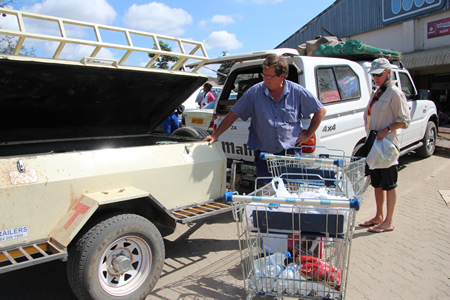 The Zimbabwean economy is suffering tragically and dramatically. But, there are success stories here, too. 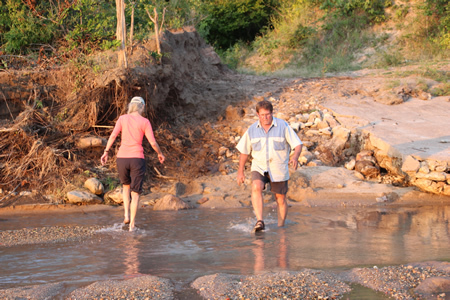 By luck, we stopped at a restaurant in a remote area of Zimbabwe. We were told that the restaurant was closed. We weren’t surprised because it had a shoddy, decrepit appearance. We started to leave, but were stopped by two men who asked if we would like to see their shop. We said, “Yes.” The men led us to a beautifully organized shop that was well hidden behind the restaurant. These two enterprising brothers employ 200 village women to knit gorgeous, one of a kind sweaters that are made out of cotton that the brothers grow. In fact, the brothers are so successful that they are exporting the sweaters. Elisabeth, Dantes, and I were so impressed with the design and the quality of the sweaters that we each made a purchase. 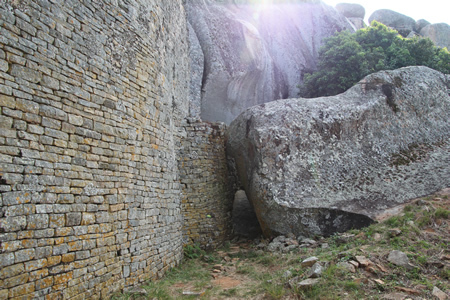 Sadly, the brothers had to hide their successful endeavor so it would not be confiscated by the Zimbabwean government. 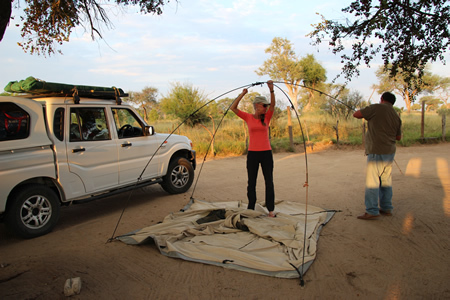 On the first night that we camped in Zimbabwe, Elisabeth tripped on the fabric threshold of the tent. She hit the ground very hard and instantly a “goose egg” the size of a lemon appeared on her forehead. Despite the fact that Elisabeth is a vegan, Dantes handed her a frozen slab of bacon and told her to put it on her forehead. The next morning we were relieved to see that the “goose egg” on her forehead had completely disappeared. However, the entire right side of her face was the color of an eggplant. 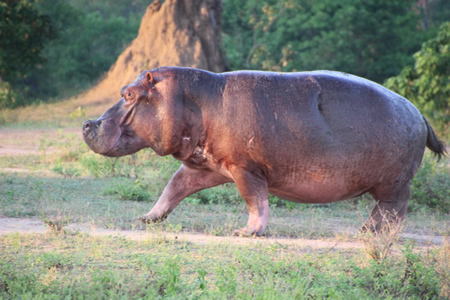 But, despite the pain of the fall and the inconvenience of traveling around Zimbabwe with her face half purple for the entire month, Elisabeth never complained once. NOT ONCE!! She’s intrepid, to be sure! 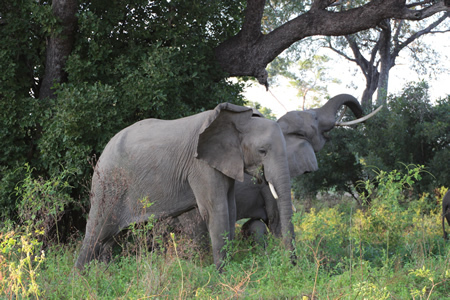 Elephants with “windy” digestive issues. A few Tsetse flies that had to be smashed on the windscreen. 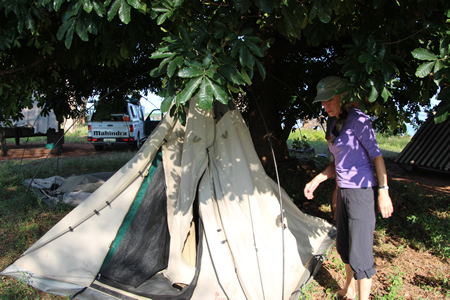 Pam Bennett-Wallberg and Dantes Liebenberg putting up the tents. 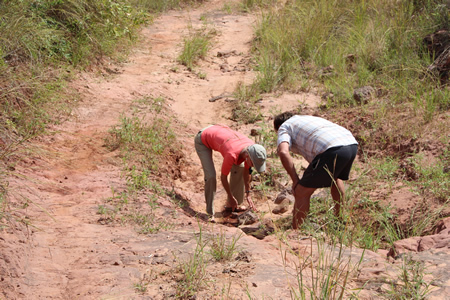 fixing a good road in Zimbabwe. putting finishing touches on the road reconstruction. Chef Extraordinaire, Dantes Liebenberg, prepares dinner. Elisabeth Spiro and the elephant that came to dinner. 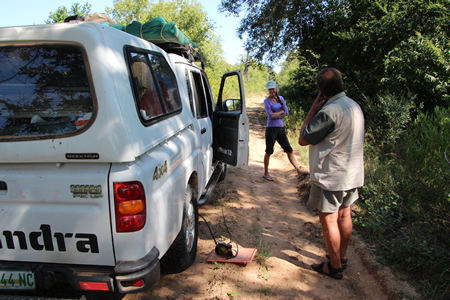 Pam Bennett-Wallberg packing camping gear in Zimbabwe. Pam Bennett-Wallberg striking the tent. 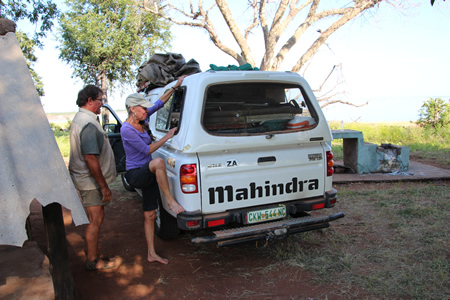 packing up the camp in Zimbabwe. 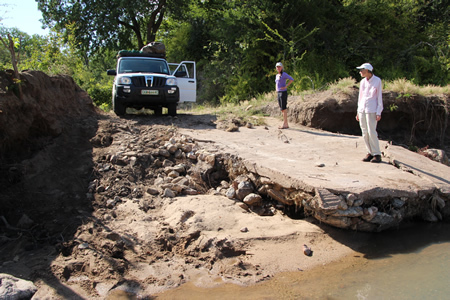 enjoying an excellent road in Zimbabwe. More good road for Pam Bennett-Wallberg and Elisabeth Spiro. 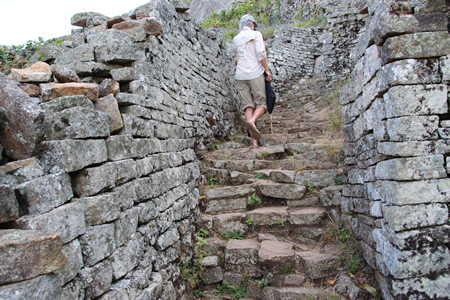 for the month long trek through Zimbabwe. 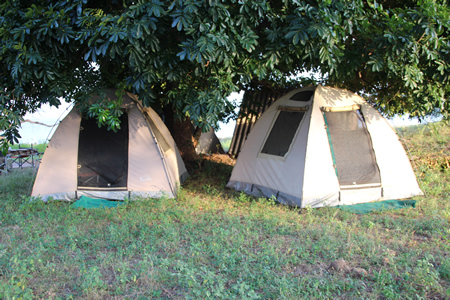 erect the tents in Zimbabwe. 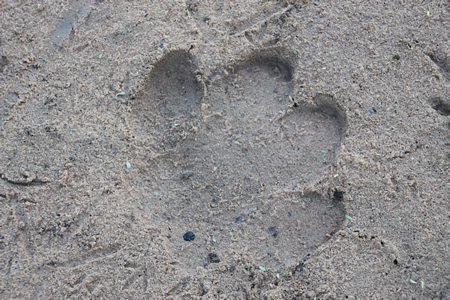 Lion track in the sand.